Consumers segments based on innovativeness and convenience orientation were identified and described based on known buying motives and barriers for fish consumption and sociodemographic factors. How well three different fish fillet product types (tray packed, vacuum packed and sold in fish counter) fit to the different segments and buying criteria were described. Three segments; Involved consumers, Convenience orientated and Modern consumers were found. The most important buying criteria’s was quality and value for money. Finally suggestions for how to target the different segments are made. Basert på hvor innovative og bekvemmelighetsorienterte forbrukere er ble forskjellige segmenter identifisert og beskrevet basert på kjente kjøpsmotiver og barrierer for konsum av fisk, samt sosiodemografiske faktorer. Videre så man på hvor godt forskjellige produkttyper av fiskefilet (skålpakket, vakuumpakket og i fiskedisk) passer til de forskjellige segmentene og kjøpskriterier. Tre segmenter; Involverte, Bekvemmelighetsorienterte og Moderne forbrukere ble funnet. De viktigste kjøpskriterier for alle segmentene var kvalitet og verdi for pengene. Artikkelen gir praktiske forslag til hvordan produkter kan tilpasses til de ulike segmentene. Norwegian and international authorities recommend that fish should be consumed at least two times per week (Advice on fish consumption: Benefits & Risks, 2004; Vitenskapskomiteen for mattrygghet, 2006). Even though fish consumption is high in Norway compared to other European countries, the scientific advice is still to increase consumption due to low consumption levels, particularly in youth, which does not reach the recommended two servings of fish per week. A considerable amount of research has shed light on consumer’s motives and barriers to fish consumption. Identified barriers to fish consumption are poor availability, perceived difficulty in preparing and cooking fish, low quality and freshness, the belief that it is expensive and perceived unpleasant properties such as smell (Leek et al., 2000; Sveinsdottir et al., 2009; Verbeke & Vackier, 2005; Verbeke, 2007). On the other hand fish has positive hedonic properties and health benefits, which consumers find attractive (Roininen et al., 2000). One way of increasing fish consumption is to introduce new products designed to meet consumer preferences. In order to succeed with new products it is recommended that innovative consumers, that is consumers that are open to trying new products, are targeted first. The reasons for this is that innovative consumers may help establishing the new product in the market and thus make it easier to introduce to less innovative consumers (Goldsmith & Flynn, 1992). New products should also fit to important food trends such as convenience. A general lack of time, knowledge, skills and abilities to prepare home meals (Gofton, 1995) influences consumer attitudes and choice toward more convenient food (Olsen et al., 2007). Thus, identifying market segments based on consumer convenience orientation might help targeting evolving consumer needs for new products. Using empirical measures based on a questionnaire, this paper identifies and describes innovative and convenience oriented consumer segments which has substantial opportunities for increasing seafood consumption. The segments are described based on known buying motives and barriers for fish consumption and sociodemographic factors. We also demonstrate how these results can be applied to a realworld product category and assess how well different fish fillet product types fit to the revealed segments and buying criteria. Consumer innovativeness has been defined as the tendency to buy new products more often and more quickly than other people (Midgley & Dowling, 1978). Two types of consumer innovativeness has been identified, innate and domainspecific innovativeness (Goldsmith & Hofacker, 1991). Innate innovativeness refers to innovativeness as a dimension of individuals’ personality (Steenkamp et al., 1999) and domainspecific innovativeness refers to consumer innovativeness for a specific product category (Goldsmith & Hofacker, 1991). As this study focuses on a specific product category, we focus on domainspecific innovativeness. Convenience orientation refers to a person’s general preferences for convenience goods and services (Berry et al., 2002). Empirical studies indicate that consumers differ in their temporal orientation, including perceived time scarcity, the degree to which they value time, and their sensitivity to timerelated issues in general (see Berry et al., 2002 for a recent review). The convenience construct is also related to different stages of buying, using and discarding of a product or service (Berry et al., 2002; Yale & Venkatesh, 1986). Various conceptual aspects of food convenience have been discussed in recent years, including the different stages in the consumption process (Candel, 2001; Gofton, 1995; Scholderer & Grunert, 2005): planning, acquisition/purchasing, preparation, cooking, consumption/eating and disposal. At each stage, convenience may have a different role and importance. For example, purchasing ingredients for an ordinary meal may focus on which shop is cheapest (convenience not the most important factor), whereas deciding what to eat can depend on how time consuming the preparation process is (focus on convenience). In order to shed light on our research questions we conducted a survey study that focused on identifying segments of consumers with a varying degree of innovativeness and convenience orientation for a given product category. One of the fastest growing categories in the Norwegian retail segment is fresh fish fillets. In the last few years several new products have been introduced in this segment. The segment consists of 3 different product types, including two types of prepacked fillets (vacuum packed and tray packed fillets) and fish fillets sold from the fish counter in supermarket, which is the more traditional product type. In order to measure domainspecific innovativeness an adapted scale originally developed by Goldsmith & Hofacker (1991) and applied in the food sector by for example Huotilainen et al. (2005) was used. To measure convenience orientation we used the CONVOR scale originally developed by Candel (2001) and adapted by Olsen et al. (2007). Buying criteria for fresh fillets was measured on two levels. First general importance of the different factors was measured on a seven point interval scale ranging from «not important at all» to «very important». Then the three different products were measured on how well they fit to the buying criteria on a seven point interval scale ranging from «very bad» to «very good». Participants (N=738) representative of the Norwegian population form the basis of the present analysis. The recruitment, fieldwork and pretesting was subcontracted to a market research agency. An online survey was used. The inclusion criteria for our respondents were that they were between 18 and 74 years old, and were responsible for at least 50 % of the households’ food shopping. All respondents bought fish on a regular basis. A hierarchic cluster analysis based on Ward’s method was performed first in order to identify the appropriate number of clusters. The hierarchic cluster analysis was followed by a Kmeans cluster analysis to reveal segment differences and characteristics. The internal reliability and consistency of the resulting factors was assessed by Cronbach’s alpha. Finally bivariate analysis including OneWay ANOVA comparison of means were used to profile the clusters in terms of sociodemographics and to compare the products’ fit to consumer buying criteria within each cluster. Consumer segmentation based on innovativeness and convenience parameters led to three groups (clusters), described in Table 1. The consumer segments were named based on the results of factor analysis on the innovativeness and convenience parameters that indicated two dimensions in the data. Segment 1 (34.4 % of the sample) can be described as the «Involved consumers». These consumers report the lowest convenience orientation. This means that they spend time and effort preparing meals, involving themselves in food preparation. Their general innovativeness is around the midpoint of the scale indicating that they are not the first to adapt new products, but neither the last. Segment 2 (32.1 % of the sample) is very «Convenience Oriented», but at the same time not very innovative. They know which meals that are convenient, and they are reluctant try something new. Segment 3 (33.4 % of the sample) is labelled the «Modern consumers». These consumers report both the highest convenience orientation and innovativeness and they are willing to try new food products, as long as they are convenient. The clusters were profiled using sociodemographic factors. Significant differences were found for household size and whether there were children or not in the household. There were significantly more consumers without children in the Involved segment, which also had the highest percentage of households in a relationship without children living at home. With less children in the household, these consumers could have more time available for food preparation (Altintzoglou et al., 2010). The Modern consumer segment had the highest percentage of children living in the household. These consumers seem very involved in new food products. At the same time most of them have children in the household and may not have the time to do a lot of food preparation. (Anderson, 1971; Verlegh & Candel, 1999). The Convenience Oriented segment has the highest percentage of both single consumers with no children living at home and parents with children. Single consumers have been found to be more convenience orientated than other consumers (Candel, 2001), and parents with children have less time available for food preparation. Both groups are not very involved in new food products. No significant differences were found for age, gender, living area and income between the segments. The fresh fish fillet market segment is one of the fastest growing in the Norwegian retail sector. When consumers consider buying fish filets, they are influenced by several criteria, which need to be take into account when developing new products and adapting the products for different segments. 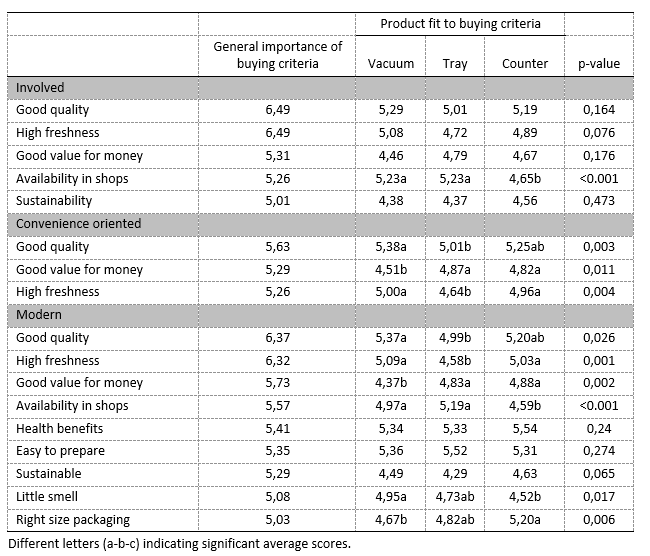 To keep focus on the most important buying criteria, only factors with a mean rating above 5 were reported (Table 2). Lower ratings were considered to be too close to the midpoint of the scale and therefore not very important for the consumers. Quality and value for money were the most important criteria for all the segments. Quality factors were most important for the Involved and the Modern consumers. The reason for this might be that the involved consumer spend more time preparing food, and thus are more aware of the quality of the fish. The modern consumers are more open to try new food products, and thus are more exposed to different products. This can lead to a higher awareness on quality. The Involved consumers found the three product types similar in terms of fit to the most important buying criteria. The only factor that was significantly different between product types was the perceived lower availability in shops for the fish counter fillets. This is not surprising given that there are a limited number of shops in Norway that actually have a fish counter. The Convenience oriented segment were most concerned about quality and value. Surprisingly, buying criteria concerning convenience (i.e. easy to prepare, available in shops) was not very important to these consumers. This might have to do with the focus on fish fillets, which was quite convenient compared to other fish products. Fish counter fillets had the best fit to the most important buying criteria, whereas the tray fillets were perceived to have lower quality and the vacuum packed products less value for money. The modern consumers used by far the highest number of buying criteria for fresh fillets. Additionally, convenience factors, health and sustainability is important for these consumers. Vacuum packed and fish counter fillets were the best suited products to these consumers. However vacuum packed products were perceived to have less value for money and right size of packaging than fish counter fillets. Fish counter fillets were less available in shops and perceived to have more smell than vacuum packed products. Tray products scored significantly lower on the two most important buying criteria, good quality and high freshness. This study revealed three distinct segments of consumers based on innovativeness and convenience orientation. Furthermore the segments have been profiled using sociodemographic variables and buying criteria, indicating the high importance of quality and value for money, in addition to factors that can be used for targeted strategic marketing and product development of fresh fish fillet products in Norway. The study also demonstrates the benefits of applying consumer segmentation methods in order to understand the target population for new and existing products in a welldefined market landscape. Ignoring consumer segments and treating a target population as a whole would have missed out on important implications for both research and practice. The first segment was the Involved segment that spend time and effort preparing food, and is neither early nor late adopters of new food products. More of the consumers have no children, which implies that they are able to spend more time on food preparation. When buying fish fillets, quality factors are the most important ones. These consumers generally don’t distinguish between different product types of fish fillets. To target these consumers high quality, and the opportunity for spending time in the kitchen when preparing the different fish fillet products, should be emphasised. The Convenienceoriented segment focuses on fast and effortless preparation of food. A possible reason for this is that this segment have more single consumers and families with children. The convenience oriented are not very interested in new products. The most important buying criteria was quality and value for money. The fillet type with the best fit for this group was fish counter fillets. Fish counter fillets are the most traditional fillet product in Norwegian supermarkets, and this fits with the low innovativeness of this segment. These consumers should be targeted with decent quality, but not too expensive fish fillets from the counter that is easy to prepare. This could be done by providing traditional ingredients with the fillets either as a partial or whole meal solution (fish fillets with vegetables, spices and sauce in a package) or that ingredients that can be used are sold separately but in close proximity to the fish counter. The modern consumers are both innovative and convenience oriented. A probable reason for the convenience orientation is that this segment has the highest number of children, which indicates less time for food preparation. They have the highest number of buying criteria, and want high quality, value for money, availability and healthy products that are easy to prepare, sustainable, and with little smell. Vacuum packed fish fillets and fish counter fillets seems to be the best product types for this segment. This is the most promising segment to target when developing new products. These consumers are among the first to adopt new products, and given the long list of buying criteria’s, several opportunities for product differentiation may exist. The Norwegian Ministry of Fisheries is gratefully acknowledged for financial support. Advice on fish consumption: Benefits and Risks (2004). In: Office, T.S. (Ed.). Scientific Advisory Committee on Nutrition. Committee on Toxicity of Chemicals in Food, London, p. 222. Altintzoglou, T., K.B. Hansen, T. Valsdottir, J.Ø. Odland, E. Martinsdóttir, K. Brunsø & J. Luten (2010). Translating barriers into potential improvements: the case of new healthy seafood product development. Journal of Consumer Marketing, 27:3, pp. 224–235. Anderson Jr, W.T. (1971). Identifying the convenience-oriented consumer. Journal of Marketing Research, pp. 179-183. Berry, L.L., K. Seiders & D. Grewal (2002). Understanding service convenience. Journal of Marketing, 66:July, pp. 1–17. Candel, M.J.J.M. (2001). Consumers’ convenience orientation towards meal preparation: conceptualization and measurement. Appetite, 36, pp. 15–28. Gofton, L. (1995). Convenience and the moral status of consumer practices. In D.W. Marshall (Ed. ), Food Choice and the Consumer. London: Blackie Academic and Professional, pp. 152–181. Goldsmith, R. & L. Flynn (1992). Identifying innovators in consumer products markets. European Journal of Marketing, 26, pp. 42–55. Goldsmith, R. & C. Hofacker (1991). Measuring consumer innovativeness. Journal of the Academy of Marketing Science, 19, pp. 209–221. Huotilainen, A., A.-M. Pirttilä-Backman & H. Tuorila (2006). How innovativeness relates to social representation of new foods and to the willingness to try and use such foods. Food Quality and Preference, 17:5, pp. 353–361. Leek, S., S. Maddock & G. Foxall (2000). Situational determinants of fish consumption. British Food Journal, 102:1, pp. 18–39. Midgley, D. & G.R. Dowling (1978). Innovativeness: the concept and its measurements. Journal of Consumer Research, 4, pp. 229–242. Olsen, S.O., J. Scholderer, K. Brunso & W. Verbeke (2007). Exploring the relationship between convenience and fish consumption: a cross-cultural study. Appetite, 9, pp. 84–91. Roininen, K., L. Lähteenmäki & H. Tuorila (2000). An application of means‐end chain approach to consumers’ orientation to health and hedonic characteristics of foods. Ecology of food and nutrition, 39:1, pp. 61–81. Scholderer, J. & K.G. Grunert (2005). Consumers, food and convenience: the long way from resource constraints to actual consumption patterns. Journal of Economic Psychology, 26, pp. 105–128. Steenkamp, J-B.E.M., F. Hofstede & M. Wedel (1999). A Cross-National Investigation into the Individual and National Cultural Antecedents of Consumer Innovativeness. Journal of Marketing, 63:2, pp. 55–69. Sveinsdóttir, K., E. Martinsdóttir, D. Green-Petersen, G. Hyldig, R. Schelvis & C. Delahunty (2009). Sensory characteristics of different cod products related to consumer preferences and attitudes. Food Quality and Preference, 20, pp. 120–132. Verbeke, W. & I. Vackier (2005). Individual determinants of fish consumption: application of the theory of planned behaviour. Appetite, 44:1, pp. 67–82. Verbeke, W., I. Vermeir & K. Brunsø (2007). Consumer evaluation of fish quality as basis for fish market segmentation. Food Quality and Preference, 18:4, pp. 651–661. Verlegh, P.W. & M.J. Candel (1999). 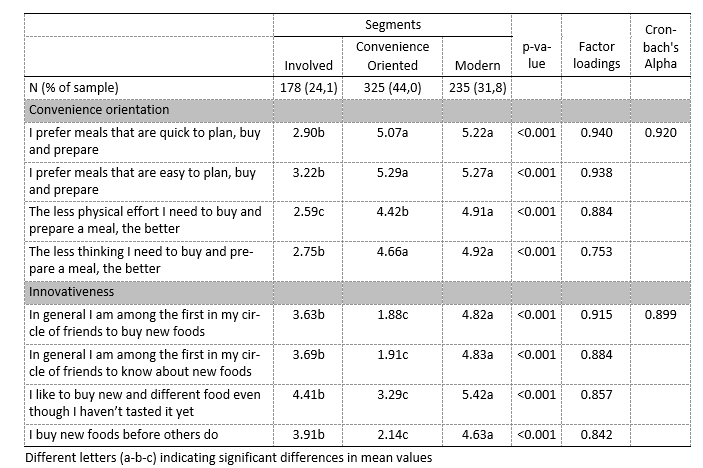 The consumption of convenience foods: reference groups and eating situations. Food Quality and Preference, 10:6, pp. 457–464. Yale, L. & A. Venkatesh (1986). Toward the construct of convenience in consumer research. In R.J. Lutz (Ed.). Advances in Consumer Research, 13, pp. 403–408. Provo, UT: Association for consumer research.